St. Joseph, Michigan is a quaint and beautiful small town that sits on a tree lined bluff that overlooks Lake Michigan and the mouth of the St. Joseph River. When you walk on our many beautiful beaches along the shoreline of Lake Michigan it is like being in Hilton Head, South Carolina walking along the ocean. When you go to the downtown area, you have the horse drawn wagon and self-pedal surreys that are allowed to travel on the downtown brick street which give you the ambiance of Mackinac Island; Charleston, South Carolina; or Savannah, Georgia. You can pretend you are visiting all of these different locations in little St. Joseph, Michigan. Weather permitting, the surreys are available every day during the spring, summer and fall seasons. They also are allowed to travel through the historic district of St. Joseph. The horse drawn wagon, which is sponsored by the Upton Foundation, is available on Wednesdays from 1 p.m. to 3 p.m., and on Sundays from 1 p.m. to 3 p.m. during the summer months. It is also available during special events throughout the year) While visiting the downtown area, you may shop in the many quaint shops and boutiques, eat at one of the many local restaurants, and always make time for a visit to the Kilwins Chocolate Fudge & Ice Cream Shoppe in the middle of downtown St. Joseph at 217 State Street. 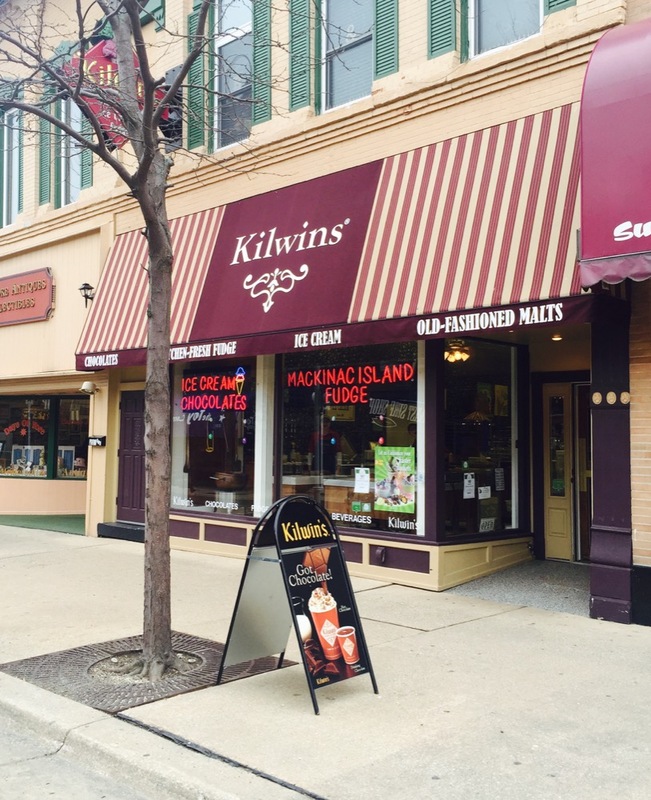 Come in and enjoy our delicious Kilwins ice cream in one of our hand-made waffle cones; our Kilwins Mackinac Island hand-paddled fudge; our delicious Kilwins caramel apples made with our own Kilwins caramel recipe. We also have our Kilwins caramel corns, Kilwins brittles, Kilwins turtle krispie treats, and so many other delicious items made in our store front window with Kilwins recipes. Please note, you can only purchase Kilwins products in a Kilwins store. We have our buy two slices of fudge and get a third slice free every day. It's a great deal! We also do beautiful gift baskets filled with Kilwins products for any event. You may select the items you want, or give us a price point you want for your gift basket and have us select the items. We do special orders for Christmas baskets. Please call ahead when ordering Gift Baskets.